After a historic week for the European Space Agency(ESA) after the Rosetta spacecraft's lander Philae managed to touch down on comet 67P/Churyumov-Gerasimenko successfully, ufologists are claiming that the comet could in fact be a UFO. ESA has made a statement about the comet emitting a mysterious "song", the origin of which is not yet known. Scientist Karl-Heinz Glaßmeierhis said of the sound "This exciting because it is completely new to us. We did not expect this and we are still working to understand the physics of what is happening." The mystery of the audio recorded by Rosetta and Philae has sparked a number of theories about what the source of the sound could be. One claim is that there is a radio communication tower on comet 67P which is broadcasting the audio in an attempt to make contact with any interested species in the solar system. There has even been an image circulated purporting to show the communications tower in the heart of 67P's terrain. An email published on the website ufosightingsdaily.com has sensationally claimed that the comet is in fact an ancient spaceship of alien origin that has been sending signals through space for decades at least. It is an anonymous email but the writer claims to be a staff member at ESA and therefore have the inside scoop on why the mission was ever conceived in the first place. Part of whistleblowing mail reads "Do not think for one moment that a space agency would suddenly decide to spend billions of dollars to build and send a spacecraft on a 12-year journey to simply take some close-up images of a randomly picked out comet floating in space. Comet 67P is NOT a comet!" The email continues by saying that "Some 20 years ago Nasa began detecting radio bursts from an unknown origin out in space" which came from the area that comet 67P has travelled from. 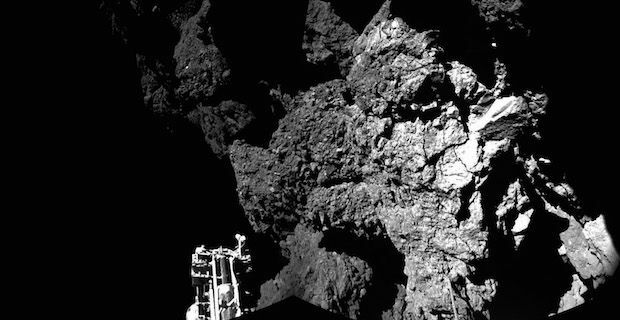 The email also suggests that the photos relayed back to Earth via Philae and Rosetta appears to show "signs on its outside of machine like parts and unnatural terrain".